Stuffed vine leaves make a yummy starter or side dish, and are popular in many countries, whether you call them dolmades, dolma, or waraq enab. 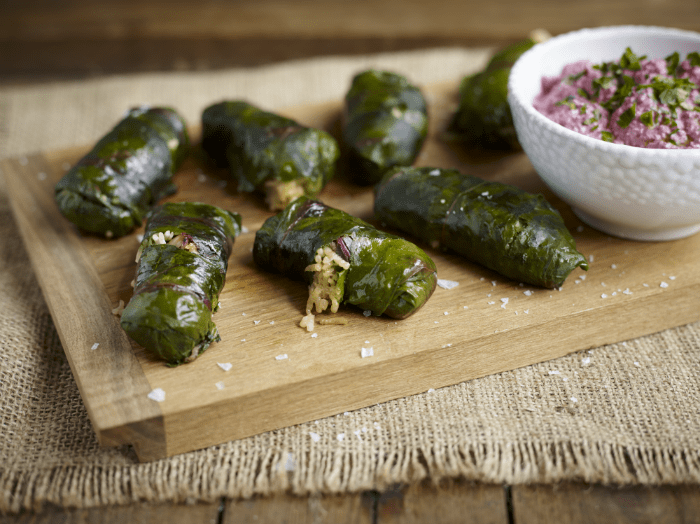 These Beet-leaf Dolmades are stuffed with rice and served with with Beetroot and Walnut Tzatziki. 1. In a mixing bowl, stir together the uncooked rice, halloumi, spring onions, garlic, lemon zest, mint and parsley. Stir through the olive oil and season to taste with chilli flakes and salt and freshly ground black pepper. 2. In a small frying pan, toast the pine nuts until they are golden brown, then tip into the rice mixture. Add the fennel seeds to the frying pan and toast for just 30 seconds or so, until you can smell their aroma wafting up from the pan. Tip into a pestle and mortar and roughly grind before stirring through the rice mixture. Set aside. 3. Spread out the beetroot leaves in a large deep frying pan and pour over some boiling water until they are well covered. Blanch over a high heat for just a minute before draining and running under cold water to stop cooking any further. Heat a large pan of water (about 1/3 full) and bring to the boil. Place the leaves in the water and leave for one minute before pouring them carefully into a colander and running cold water on them to stop them cooking. Drain well. 4. On a clean work surface or board carefully flatten out one beetroot leaf with the stalk end pointing towards you. Place a generous dessert spoonful of the rice mixture in a sausage shape about 1 inch from the bottom of the leaf and fold the edges in. Fold the bottom of the leaf up and around the filling and tuck it in. Carefully roll the parcel up so that is resembles a small cigar. If any holes appear or you have a torn leaf you can patch it with some of the spare leaves. Continue until you have 12 stuffed leaves. 5. Place any spare leaves and the sliced lemon and bay leaves in a large saucepan with a lid. Carefully arrange the stuffed leaves over the top of the lemon and pour over the boiling water or stock and olive oil. Place a small plate on top of the leaves to weigh them down, place the lid on the pan and cook over a very low heat for 40 minutes. Check one stuffed leaf to make sure the rice is cooked. Remove the stuffed leaves with tongs and set aside to cool. 6. Whilst the dolmades are cooling, make the tzatziki. Add the walnuts to a small frying pan and toast over a medium heat for a couple of minutes then tip into a food processor and grind to coarse crumbs. Add the beetroot, garlic, yogurt, olive oil and mint and blitz to a smooth puree. Season to taste with lemon juice, salt and pepper and spoon into a small serving dish. 7. 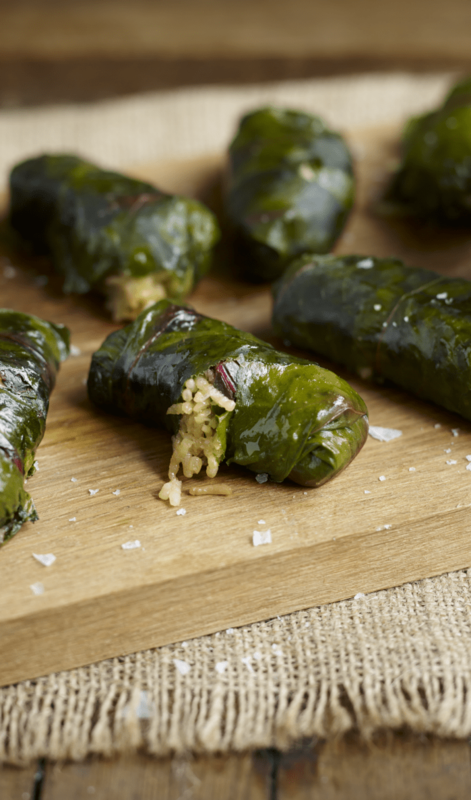 Serve the dolmades warm or cold with the tzatziki.